The first annual Chess.com Computer Chess Championship (CCCC) will decide which engine is the best at the format of chess most played online: speed chess. 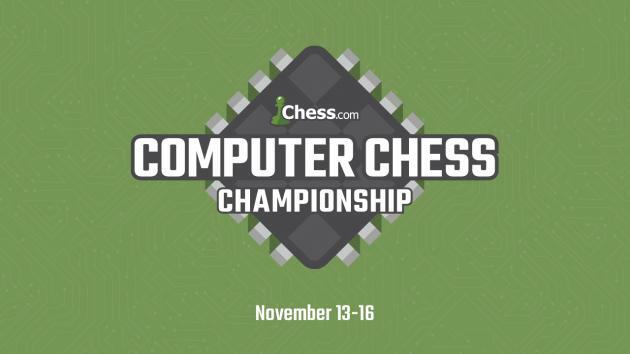 The 2017 Championship is scheduled for Nov. 13-16, with all four days featuring full live coverage on Chess.com/TV with master commentary and high production values to promote computer chess as a fun viewing experience for the modern gaming audience. The tournament will include the top 10 engines in the world (CCRL 40/40 - seeded as of mid-August), with an option for engine authors to submit development/optimized versions of their programs. It will be a double round-robin, with each program having White and Black once in a 15/2 against every other engine. The top-two scoring engines in the round-robin will face each other in a thrilling super-final, where time controls will transition from rapid to blitz and finally to bullet chess as the match proceeds. Chess.com will provide four days of live coverage with master commentary, broadcasting all 90 games of the round-robin and all 20 games of the super-final. All other UCI options will be set to default. Time control: 15/2 for round-robin play. Round-robin, all-play-all. Each engine gets White and Black once vs each other engine. That means nine rounds with 10 games per round and 90 games total. Three Chess.com/TV shows of round-robin play with 30 games each (Nov 13-15) will be broadcast. One show per day, with three rounds per day, for three straight days. An exciting super-final match on day four between the top two engines will take place Nov. 16 and will be broadcast live on Chess.com/TV. Each round of round-robin play will have both games between each engine start simultaneously (e.g. Komodo plays Stockfish with White and with Black at the same time). There will be staggered starting times so that each of the five mini-matches per round starts five minutes later than the previous round. Four concurrent games per round, two White and two Black per engine. Each round has a different time control. After 20 games over five rounds, a champion is crowned. If tied after round five, there will be played individual sets of four simultaneous games at 1/2 until a champion is crowned. If after four additional rounds of 1/2 (16 tiebreak games total) the score is still tied, the two engines will alternate single 1/2 games as White and Black until there is a winner (sudden death with no chance to equalize). The engine to first get White will be determined by a virtual coin flip on Random.org. I hope you set some time aside and come join us for this exciting event!